have to solve every time you putt. For every breaking putt you have to assess both the direction and extent of the break. Until you can determine this information, you will be putting with doubt in your mind. Because greens are sloped for the water to run off, most putts have some break to them. Unless you are putting straight up or straight down the local fall line, your putts are going to break either left or right. The first part of the puzzle is deciding which way the green slopes between your ball and the hole. On heavily contoured greens this is an easy decision to make. However, when the slope is more subtle, the task is more difficult. On long putts your primary concern is getting the ball close to the hole. Distance is more important than direction. Of course you are hoping to hole every putt, but the longer the putt, the less likely you are to succeed. The putts that really change your score are those in the makeable range of four to five feet. When you are faced with a makeable putt, the slope is typically uniform with the surface being tilted in only one direction. It would be unusual to have a double-breaker on such a short putt. Now you have a decision to make. Firstly do you putt straight, to the left, or to the right, and secondly what is the extent of the break, if any. 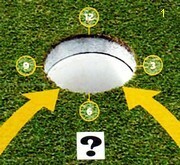 The answer to the first part of this Putting Puzzle is to know the direction of the local fall line through the hole. On the fall line there is no break. Right of the fall line, either uphill or downhill, your ball will break right to left. Conversely left of the fall line, again either uphill or downhill, your ball will break left to right. Unless you are clear on the direction of the break, you are at best guessing. This is hardly a recipe for a confident putt. So how do you find the local fall line since relying only on visual clues can be deceptive? This can be achieved through past experience of the putt, or by previously mapping the green on a green map that you carry. Some suggest you can feel a change of direction with your feet from uphill to downhill as you walk around the hole. If you do this, make sure you don't step on anyone's line. The second part of the puzzle is determining the degree of slope between your ball and the hole. The greater the slope, the more gravity will affect its roll. However, on any given slope the green speed, together with the force of your stroke, will determine how much your ball will break. For example, the faster your ball is travelling the less it will break. The downside of too great a speed is a failure for the ball to drop half its diameter as it travels over the hole. This can lead to a lip-out or longer come-back putt should you miss the hole completely. So the Putting Puzzle has several parts. Each part has to be solved for a successful outcome. There is no magic involved, just the simple laws of physics.